One of the most frequent questions I receive as a True Austin local is "What can I do with my teenager when we visit Austin?" Thankfully, I have a resident teen to ask. South Congress Avenue is always part of the answer. It&apos;s my daughter&apos;s favorite place to spend an afternoon, especially when I&apos;m on hand to pay for treats along the way. So, based on her suggestions, here is a teen-friendly itinerary for exploring Austin&apos;s eclectic SoCo. Because every good outing should start with dessert, dont you think? This old fashioned candy shop and soda counter is packed to the gills with every sugary treat imaginable. 1700 1/2 S. Congress Ave.
South Congress is an ideal shopping destination for vintage clothing and accessories, my teen&apos;s favorites. For a map of local shops, check out the Vintage Around Town Guide. This incomparable costume shop is jam packed with styles and accessories from every era. Weave your way through the maze of unusual apparel and have a good laugh over the wacky wigs, hats, shoes, and more. Step inside this cozy little house on SoCo to enjoy a hot beverage, while perusing the glasses and shoes available for sale. As an added bonus, the store regularly hosts free events (yoga, movies, crafts, and even DJ school). Take time to admire the murals adorning the outside walls of the restaurant, then order yourself a cheesy slice of heaven! There&apos;s not a lot of indoor seating available, so you may want to order from the outside window and take your pizza to go. You can&apos;t spend an afternoon in Austin without getting a bite to eat from a food trailer. The Hey, Cupcake! airstream is located on the corner of South Congress Avenue and Elizabeth Street. Order a cupcake, then order your teen to pose with the "Smile! even if you don&apos;t want to" mural nearby. A mere two blocks east of the Hey, Cupcake! trailer is a huge chalkboard of hopes and dreams. What would you like to do before you die? Add your wish to the wall! By this point, you are probably full, and possibly broke. But, if you can squeeze in one last indulgence, head back to Congress Avenue for Amy&apos;s Ice Creams (1301 S. Congress Ave.) or Jo&apos;s Coffee (1300 S. Congress Ave.). Make sure to take a photo by the "I Love You So Much" mural while you&apos;re there. 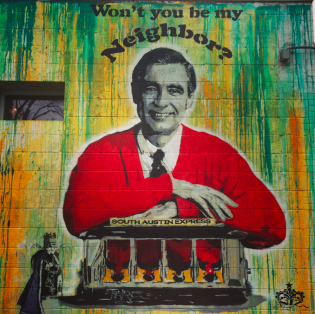 Contributed by Heidi Gollub, True Austin Family Insider and creator of Free Fun in Austin. Photo of Mr. Rogers representing at Home Slice Pizza. Photo by Heidi Gollub.